The Municipality of Dalaguete, Cebu is indeed a place of alluring wonders - breathtaking mountains, charming heritage sites, enchanting beaches, fascinating forests with unique flora and fauna, and spectacular reefs teeming with diverse marine life. These are wondrous places which very few Cebuanos have known or heard. These places emit the serenity of the countryside, the tranquil surroundings amid lush greenery, never before seen by the majority. Osmena Peak is known to be the highest peak in the province and Island of Cebu. Base on actual GPS altitude, it stand approximately 1000 meters above sea level. Osmena peak is located in the vicinity area of Mantalungon, (a town that is around 700 to 800 meters and probably one of the highest towns in Cebu. 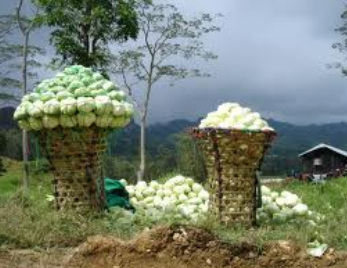 Mantalungon has been known as the vegetable kingdom of Cebu. Its really unusual finding this town where you feel it was like an area in the Cordilleras were they have their trading post for vegetable dealers and townfolks and children are wearing jackets at high noon. Reminds me of Baguio City and La Trinidad). Osmena Peak is uniquely different from any other mountain peaks in the Philippines. 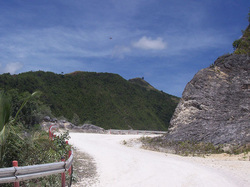 Multiple jagged hills, or quite simply known as the Mantalungon range, are grouped together overlooking and stretching as far as the Badian shorelines. Visually, it's similarly formed like the Chocolate hills of Bohol, but are thinner and sharper pointed peaks. Unlike the Famous Chocolate hills, the peaks are grouped almost near each other and are obviously formed from rocks that have survived through time. One of the highest jagged yet almost perfectly formed hill was named Osmena Peak in honor of the famous political Clan in Cebu. One can trek across the mountain ranges to get to Badian, practically cutting across the island of Cebu westward. View from The peak: Northwest from the summit, you can view the Badian shorelines and the Badian Island. Northwest, the beaches of Moalboal: Panagsama whitesand shorelines, connects Badian. Southeast from the summit, you can see the remaining vegetable farms of Mantalungon. Public Vehicle: From Cebu, make your way to Cebu City's Carbon market and inquire from the area where the terminal for Mantalungon mini-bus is located. The terminal is stationed near the gasoline station. From Cebu, the bus will travel until Mantalungon. From Mantalungon, make your way up to Osmena peak for a 1.5 hour hike. The other alternative is to take the big buses stationed at the Cebu South Bus Terminal. Look for buses travelling southwards to Oslob or Bato via Dalaguete and drop off at Dalaguete junction. Going back: You can either hike back to Mantalungon or hike down across the mountain ranges to Badian through Kawasan Falls. Hiking back to Mantalungon, you can catch up hourly buses back to Cebu.If you decided to hike down to Kawasan Falls, make your way from Kawasan Falls to the national highway near the shorelines of Badian. There are mini buses and big buses passing by every hour that will take you back to Cebu City. 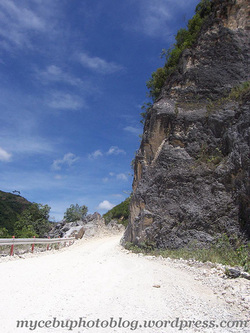 Private Vehicle: From Cebu, make your way via South Cebu National highway until the town of Carcar. Instead of taking the right road for Badian through the mountain highway, make your way semi-round the Carcar rotunda to continue southeast until the town of Dalaguete. 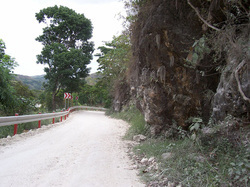 Reaching Dalaguete, take note of the the junction to your right which will lead you up to the mountains. You will not miss this junction as it is just after the bridge and the corners of the junction are populated with bakeries and habal-habals waiting for passengers (public utility motorbikes). I'm fascinated with Cebu province's cities and towns having the most bakery in every corner. 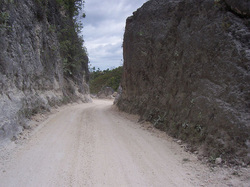 Continue your up through the cemented road until the road starts to convert into fire and rough road. 4X4 vehicles are preferred, but tall 4x2 vehicles can manage up. The road winds up and around the mountains until you will feel the coolness of the area and be able to view the shorelines of Dalaguete. 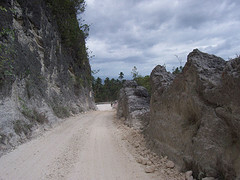 Road reaches up to Mantalungon. From Mantalungon, it will take you more than an hour to reach Osmena Peak. To save time, you can actually drive your vehicle until the jump off point nearest the foot of the ranges. The tallest peak in the province and island of cebu. 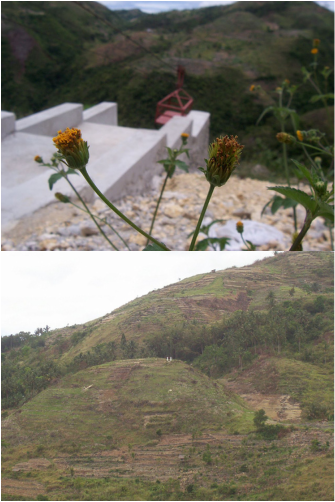 Mercado's peak is another peak in mantalongon, dalaguete which is nearer to Osmena peak. It also offers spectacular views when you're already at the top of the mountain. The trail culminates to a peak which, unknown to many, was used by the American Military during the 2nd World War. Oral accounts has it that the summit which towers 825 meters above sea level, used to house military communication, and triangulation contraptions and a flag pole. Strategic indeed. The summit of Bandera Peak offers an unlimited visual extravaganza making visible cities of Cebu and Tagbilaran, as well as the whole stretch of Bohol Strait, the island of Siquijor and the coastal barangays of Argao and Dalaguete. Protected by the Dalaguete Bantay Lasang, Bandera Peak is dotted with lush tropical foliage and a variety of ferns, orchids, and shrubs. Experience a “Mt. Everest-like-sensation” from the months of September to January as the peak is most often covered with thick fog. The rest of the months offer an unhampered visibility. 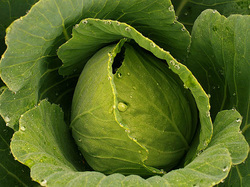 Temperature range from 26 to 33 degrees in summer and 20 to 25 degrees in rainy seasons. 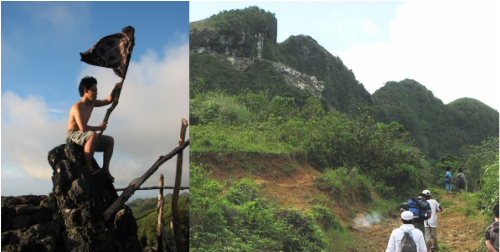 Before reaching Osmeña Peak, the highest peak among the Mantalongon range, trekkers pass through a cave where it is famous for its thousands of bats and other nocturnal denizens flying in and out of the cave. That's why it is called Kulabyaw Cave. Embark on a trek to probably one of the hardest obstacle adventure sites in the province. This hidden valley is a haven for biodiversity and endemic flora and fauna. Start off at the Cawayan Sumbria Bridge and experience a river trek that could put you on the list of certified adventurers. Get a treat of huge black boulders , untouched waterfalls, treacherous river banks, impenetrable walls of thorny plants and slippery rocks. Scout for elusive monkeys and fruit bats (kabog) as huge as foxes and observe in close range the characteristics of the fabled and endangered Cebu Black Shama (siloy) as they belt out their enchanting bird songs. Lagnason creek is a natural habitat of four species of huge flying foxes roosting together by the hundreds in one colony which is unique and the only one of its kind in the region: Large flying fox, Golden-crowned flying fox, Little Golden-mantled flying fox, Island flying fox. Two of these species are the world’s largest flying foxes (kabog) and this is the only place in Cebu where you can find these species (DBCMC, CBCF 2006). 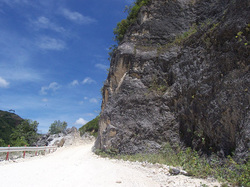 Rock Formation is located a few kilometers outside the borders of Barangay Mantalongon. 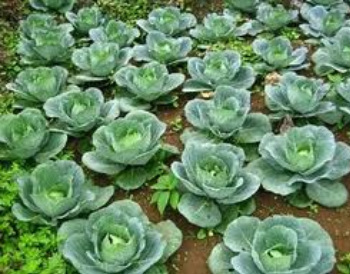 It is located already in the premises of Sitio Lugsangan, Barangay Tabon. 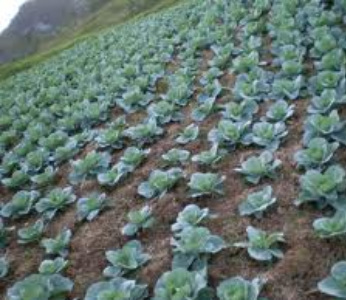 It is also a favorite destination of mountaineers, not only from the town itself but also by people from other municipalities, for its fresh cool air and mountain view top. 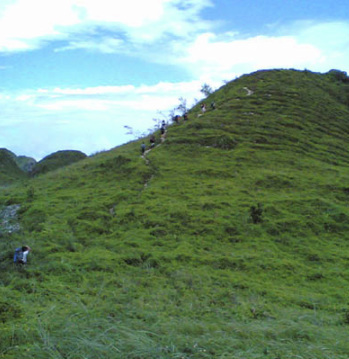 Mantalongon, Dalaguete has been a tourist destination for mountain climbers because of the highest peak called osmena peak. 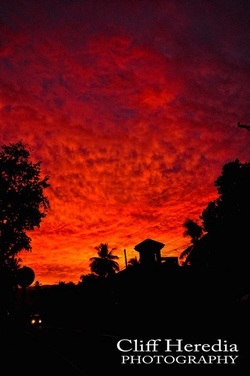 Mantalongon was once called as a little baguio of cebu due to cold weather here like baguio. Yep. They had to cut through this hard rock. Amazing! Located at the heart of Banhigan, Dalaguete, Cebu. 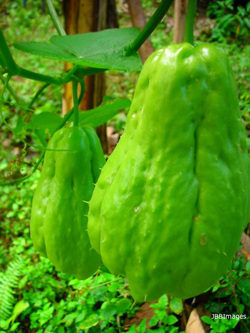 This is one of the distinations of the locals here during holidays or family picnics. There is no entrance fees collected except for cottage that only cost about P50.00 only. The goods go to those two white pillars on the other mountain. 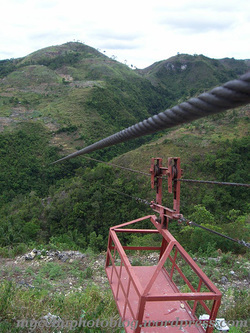 The only zipline in Dalaguete. A love project of Hon. Ronald Allan Cesante during his term. 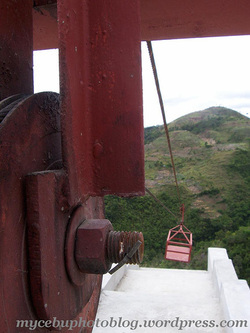 This project was once featured in an episode of 24 Oras of GMA 7. 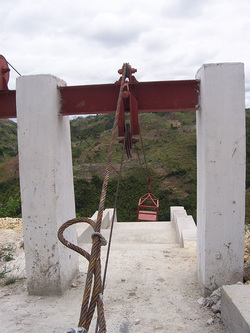 The purpose of this zipline is not for fun, instead, its mean purpose is to transport goods mostly vegetables from this mountinous areas that don't have the access of barangay roads.